Please try to keep changes to a minimum. 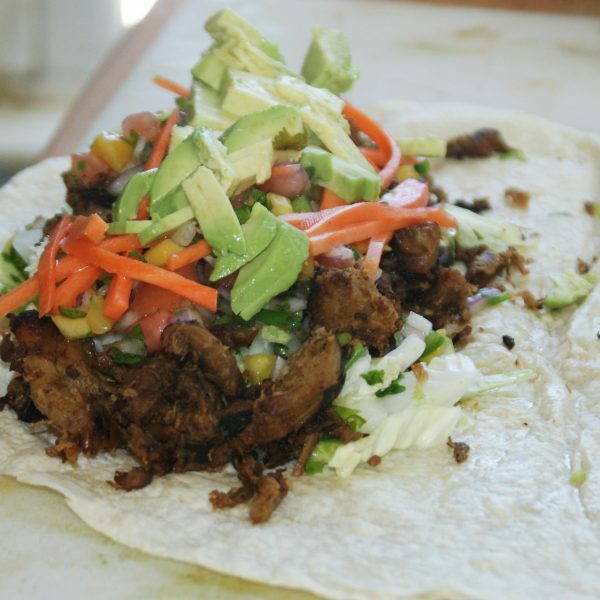 We prepare everything on the menu fresh every day. We have what is on the menu. if you don’t see it on there, we don’t have it that day. We must limit orders to 15 items or less. Huge orders hamper our best efforts to get everyone fed in a timely manor. Please accept our apologies for the phone being turned off (no it’s not malfunctioning, it’s off..)when we are very busy at lunchtime. We feel we must give priority to the folks standing in line in the store, and sometimes we just can’t do both. It’s Chaos, Try to be kind to your fellow humans, And THANK YOU for Coming to the crazy house we call BREADZILLA. Lunch Is Served From 11:30 AM Until 2:30PM (1:30 PM On Sunday) We know this seems odd to a lot of people but try to remember we are primarily a BAKERY, not a restaurant. We Are Prepping Like Mad! Thick and Hearty. Vegan. Gluten Free. No dairy. Flavorful and Fresh with Coconut milk, lemongrass, cilantro, and rice noodles. Vegan. Thick and Hearty with Fresh Leeks and Carrots. Vegetarian. No milk or cream. Contains parmesan cheese. 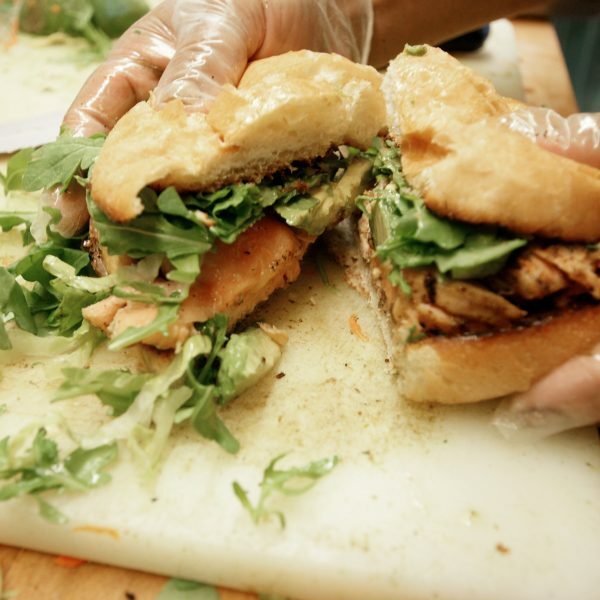 Blackened Salmon Fillet On grilled Squishy with Avocado, Arugula, and Our House Made Lemon Vinaigrette. On grilled squishy roll with lettuce. On toasted squishy roll with lettuce, tomato, and awesome sauce. On toasted honey wheat, melted cheddar, avocado, lettuce, and honey mustard. 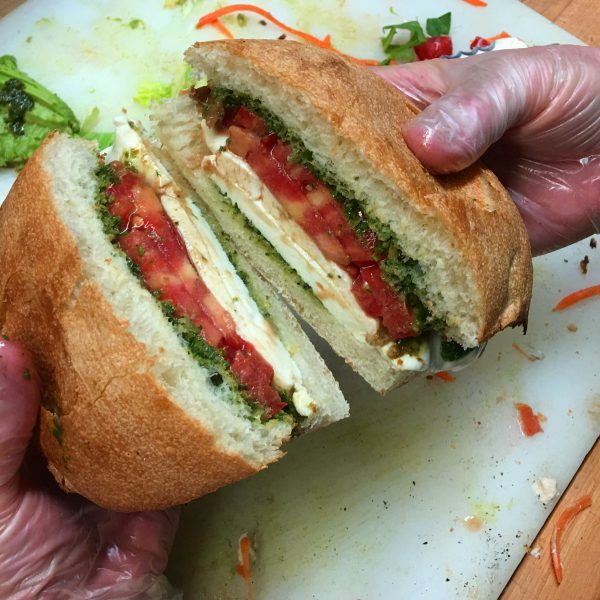 Tomato, melted fresh mozzarella, and pesto on toasted squishy with balsamic vinaigrette. Toasted honey wheat, cheddar, avocado, tomato, carrots, sprouts, and mustard mayo. 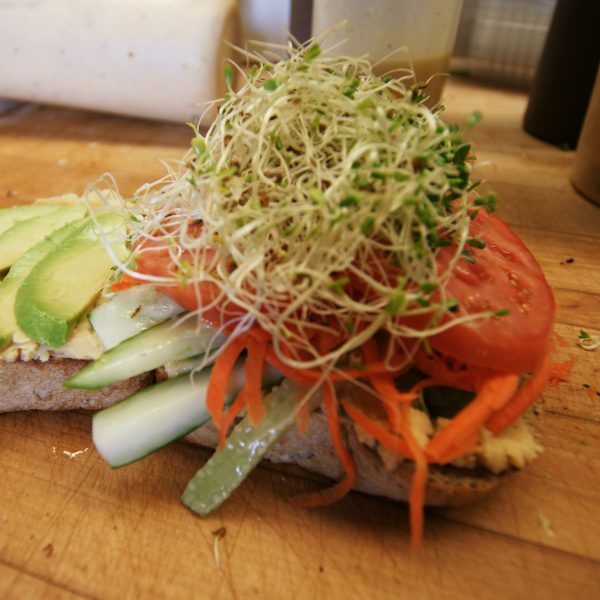 Toasted honey wheat, avocado, tomato, carrots, sprouts, and our hummus. With lettuce, tomato, and lemon vinaigrette. On toasted Eight grain bread. Tuna salad, melted jack cheese, and pickled jalapenos. 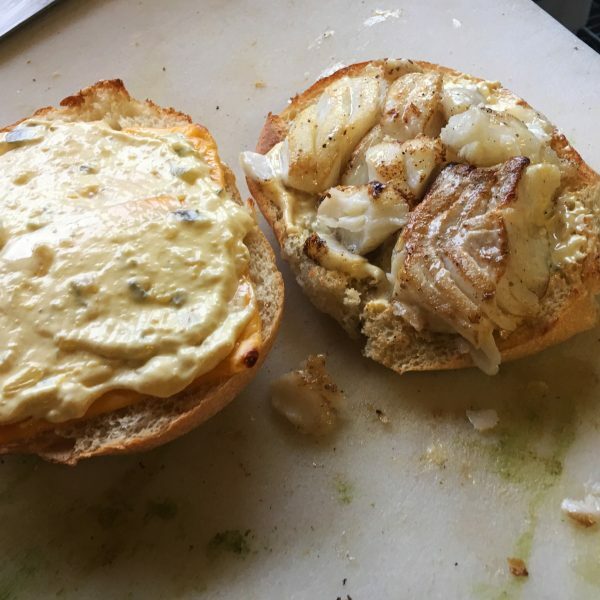 On grilled Squishy Roll with our homemade tartar sauce. Oven Roasted, Not Fried! Pan Seared Cod fillets on toasted squishy roll with melted American cheese and our homemade tartar sauce. 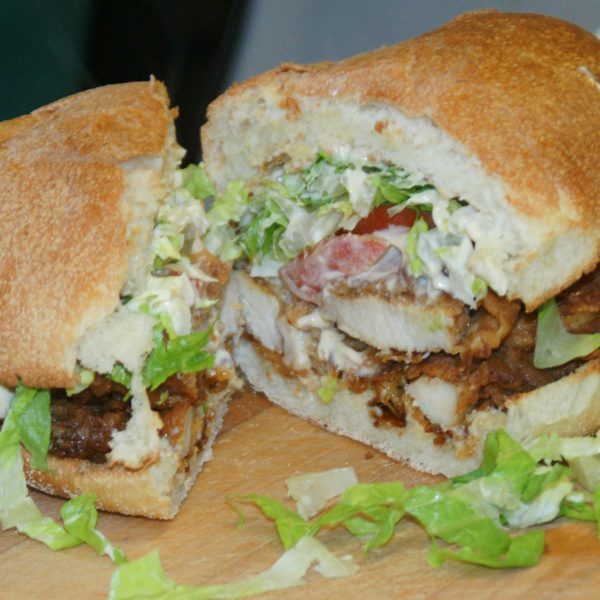 Slow Roasted, tender juicy Pulled Pork on a Toasted Squishy roll with Lettuce, Tomato, and our Infamous Awesome Sauce. On Toasted Squishy Roll, with melted American cheese, sliced sweet pickles, lettuce, and mayo. 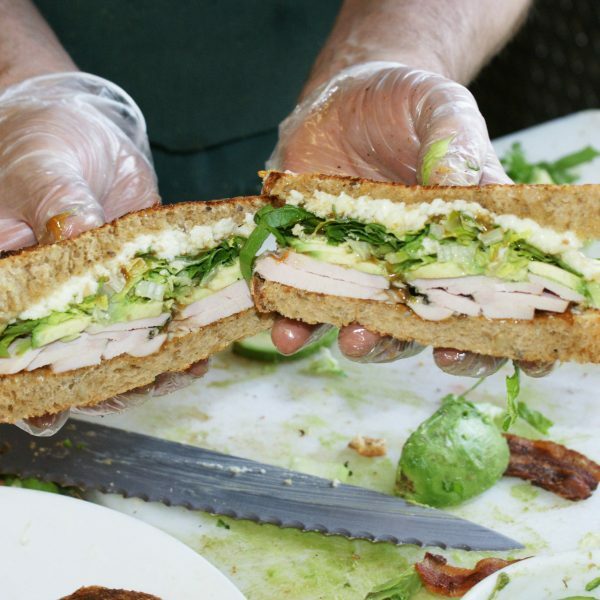 Made with tender Oven Roasted Chicken, Celery, Red Onion, Mayo, and Spices. Wrap OR salad. With avocado, spicy carrots, greens, & mango tomato salsa. Choice Of Classic seasoned ground Beef OR Black Beans with jack cheese, sour cream, avocado, tomato, lettuce, and green sauce. Egg Salad On our toasted olive rosemary bread with lettuce and tomato.